We had a wonderful Mentoring Roundtable on October 4, 2018. It was a special session for our Financial Mentors and other Financial Literacy volunteers, as they had an opportunity to meet and receive training from our clients. Paul and Sinalak first met Britepaths and Financial Empowerment Center at South County (FECSoCo) staff at the Northern Virginia Housing Expo in March. They didn’t have time to get one-on-one coaching that day, so we encouraged them to attend a free Financial Counseling Clinic. From there, they were matched with volunteer Financial Mentor Rick Froehlich. Now, they are also receiving services at the FECSoCo. In addition, Britepaths' MPower Loan committee accepted their application for an interest-free loan from us that is helping them pay down debt they accumulated largely due to education costs and student loans. 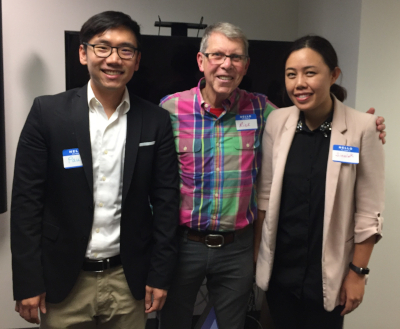 To show their gratitude, they joined us at the Mentoring Roundtable, and Paul and Sinalak gave our volunteers and staff a tutorial on using video conferencing to help mentors and clients meet even when they can't meet in person. It will never replace one-on-one meetings, but it is a great tool for keeping the meetings going when it is harder to meet in person. It was a valuable discussion, and we're grateful for their help. Britepaths and FECSoCo are grateful to our grantors and supporters who are helping make it possible to provide the services described here. Paul and Sinalak are in a much better place now, and are so grateful. Thank you to Foundation for Financial Planning for funding our one-on-one Financial Literacy services, and thank you to United Way of the National Capital Area and Fairfax County for funding and partnering with us to support the Financial Empowerment Center at South County. Click Here to learn more about accessing Britepaths' Financial Literacy Services or how to become a Financial Literacy Volunteer.